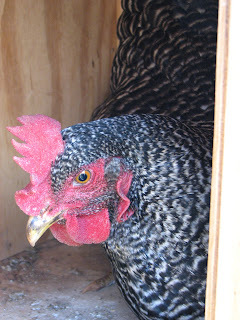 We have had chickens now for 4 years and each Spring leaves us wanting to improve upon our current "Chicken Tractor". Karl took advantage of this very windy, rainy day to work on "Phase 3" in the garage. I was wooed by an edition of Southern Living to consider free range chickens. An article showed a nice little chicken advertised as "bug control" in a perfectly manicured garden. HAH ! In retrospect, the lady obviously had a landscaper and her little floofy dog had been groomed and did not "wear the colors" of country dogs who just love to eat and roll in chicken poo. While I love my "Ladies" they are not kind to my landscape or garden beds and have unfortunately this year destroyed my entire winter crop of kale and collards. So after much research - on to Phase 3! We are constructing A Frame style coops with attached runs which we can scoot across the lawn- similar models online sell for boutique prices- but we figure we can use salvaged cedar and other materials to find a situation which will protect the birds, the gardens and my sanity. Dreams of poo free shoes are not far away! If you would like to learn from our mistakes- check out our Chicken Page!